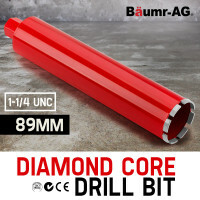 Suitable to Drill into: Concrete, Poroton, Cellular Concrete, Ytong, Marble, Bricks, Tiles, Granite, Stoneware and various other Masonry and Concrete surfaces. Looking for heavy-duty drill bits to make clean cut holes in super tough materials? 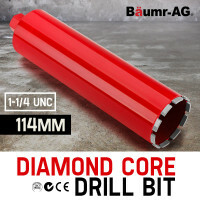 Baumr-AG comes with an extensive selection of products that can penetrate almost any masonry and concrete surfaces. They are suitable to drill into concrete, stoneware, granite, tiles, bricks, marble, ytong, cellular concrete, poroton and so much more. Made with commercial-grade steel, the Baumr-AG Diamond Core Drill Bits are expected to last the long haul. The diamond cutting teeth allow them to easily and precisely chew through extremely solid surfaces. Choose from a variety of cutting diameters that perfectly suit your specific needs. They come in 20mm, 53mm, 63mm, 76mm, 89mm, 102mm, 114mm, 127mm and 152mm versions. The 20mm drill bit is 370mm long, while the rest are 455mm long. 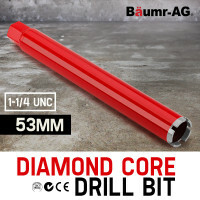 Using revolutionary technology, the Baumr-AG Diamond Core Drill Bits are stronger than conventional brazed bits. Even when used for high speed drilling, you can still expect the same clean, straight cut holes on either side of the point. In short, these faster and longer-lasting multipurpose bits can withstand even high-horsepower applications. 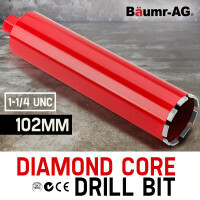 The Baumr-AG Diamond Core Drill Bits deliver optimal cutting configuration with their their evenly spaced and accurately positioned diamond cutting teeth. More importantly, they are affordable, high performing and are made with high safety standards deep in mind. 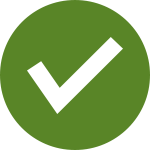 Compatibility is also not an issue as they can be used with both rig mounted or handheld units. Edisons also offer other high quality, easy to use and long life construction equipment that are perfect for tradesmen and DIYers alike. Choose from a variety of cement mixers, paint sprayers, rebar cutters, jackhammers and nail guns. Also available are hand tools, measuring tools, drywall/plastering products, commercial drain cleaners and concrete vibrators. 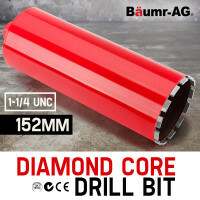 Order a Baumr-AG Diamond Core Drill Bit today and experience what high quality hole cutting is all about!